Emerging technologies and trends are disrupting the status quo for manufacturers around the globe. Many tenured employees are approaching retirement age, which means a new generation of manufacturers is entering the workforce. This shift in personnel causes a shift in expectations, capabilities, and knowledge that manufacturers can’t afford to ignore. Further, factory retirees will take decades of irreplaceable experience and knowledge with them when they go. Another noticeable trend is the emergence of new global markets. Developing nations are growing at an exponential rate, which means global competition will continue to increase. Some of these countries are expected to outperform leading nations in the coming years. A third factor manufacturers need to consider is the increasing scarcity of resources—most notably, energy. As previously undeveloped nations race to compete on a global stage, a need for more and new power emerges. With businesses and individuals around the globe consuming energy at the highest rates in history, recent steps toward energy efficiency will likely become a wide-scale sprint. Recycling, renewable energy, and other solutions will be essential to keeping up with the global demand for goods. Another shift worth watching in the U.S. is the trend toward higher education. As more and more young workers choose to pursue higher education, the population of skilled laborers to can perform manufacturing jobs will shrink. Many businesses will need to look beyond our borders for talent capable of performing the jobs manufacturers need. Although these trends may seem overwhelming, they represent opportunities for manufacturers with a growth mindset. Adopting and applying emerging technologies like social, mobile, cloud, analytics, sensors, and robotics to your business can make it a leader well-positioned for growth. 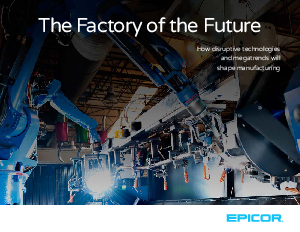 Download the eBook to learn how you can take advantage of the changing market landscape and become a factory of the future.